*I'm leaving out a lot, believe me. 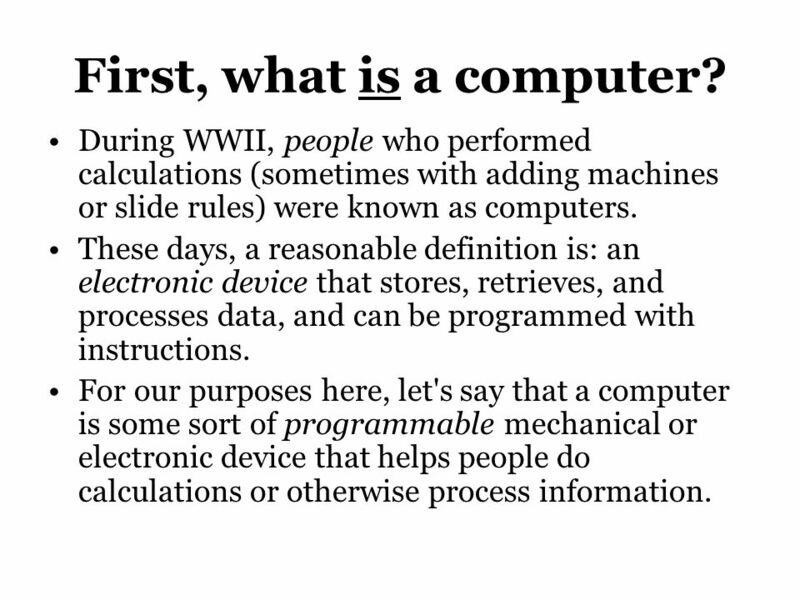 . .
2 First, what is a computer? 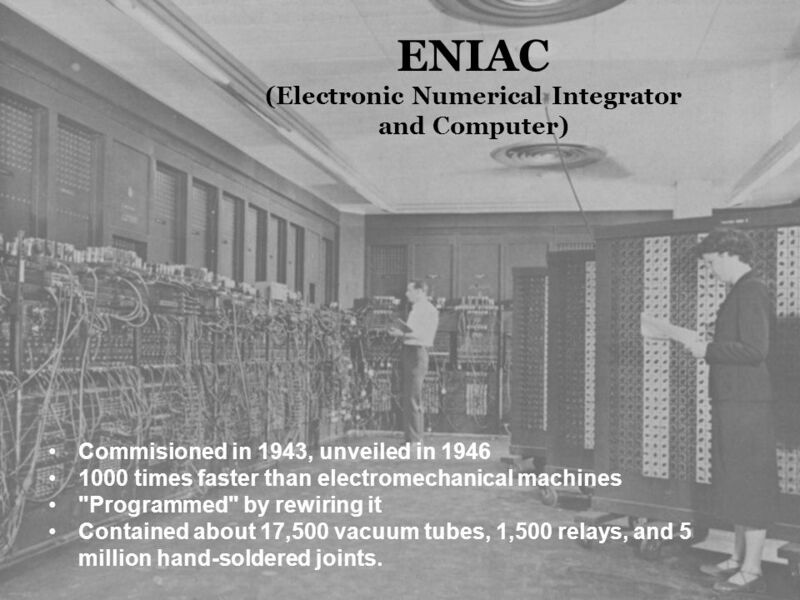 During WWII, people who performed calculations (sometimes with adding machines or slide rules) were known as computers. These days, a reasonable definition is: an electronic device that stores, retrieves, and processes data, and can be programmed with instructions. For our purposes here, let's say that a computer is some sort of programmable mechanical or electronic device that helps people do calculations or otherwise process information. 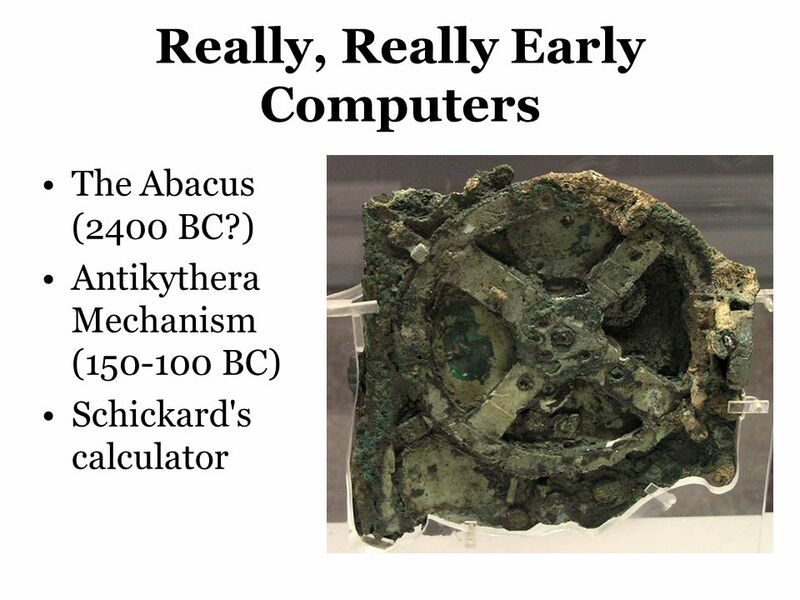 The Abacus (2400 BC?) Antikythera Mechanism ( BC) Schickard's calculator Abacus Antikythera Mechanism believed to be an ancient mechanical calculator (also described as a "mechanical computer" designed to calculate astronomical positions. 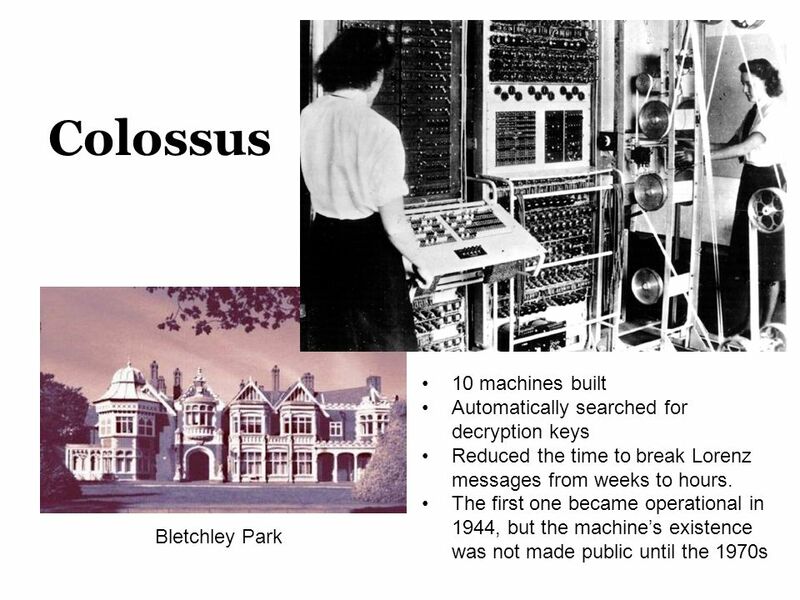 Other machines using technology of such complexity would not appear until the 18th century Wilhelm Schickard seems to have built first calculator in 1623 – could add, subtract six-digit numbers, with a bell for seven-digit overflows – not programmable. Not well known at the time because he died of the plague soon after inventing it. 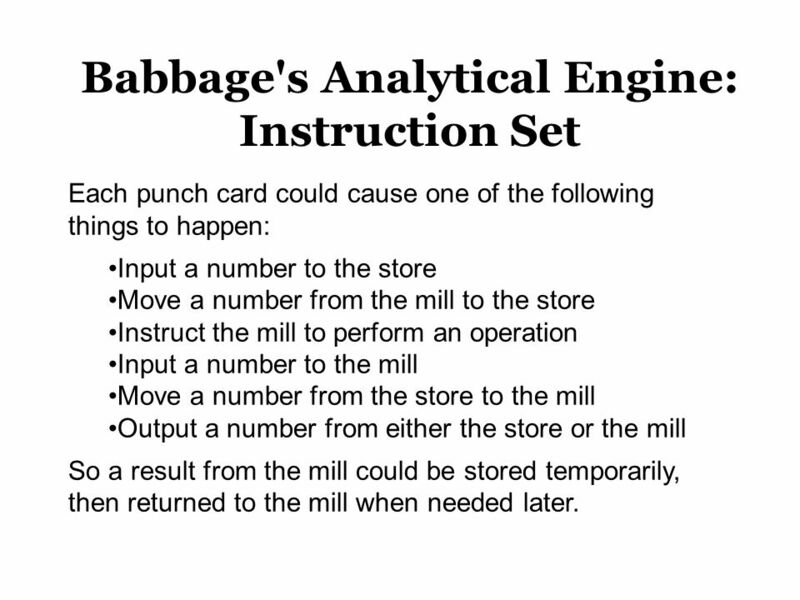 Each punch card could cause one of the following things to happen: Input a number to the store Move a number from the mill to the store Instruct the mill to perform an operation Input a number to the mill Move a number from the store to the mill Output a number from either the store or the mill So a result from the mill could be stored temporarily, then returned to the mill when needed later. Relays are mechanical switches controlled by electromagnets. 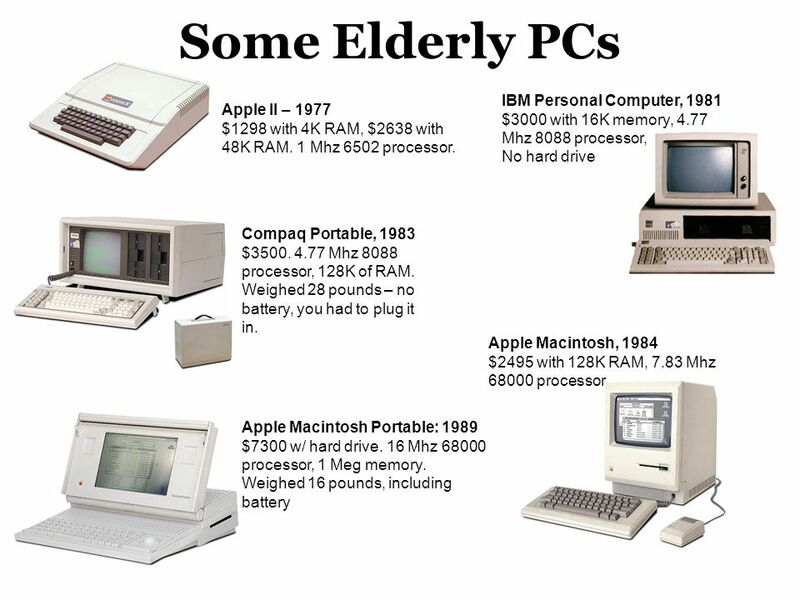 They are very reliable, cheap, and use little power, but are slow compared to electronic devices. 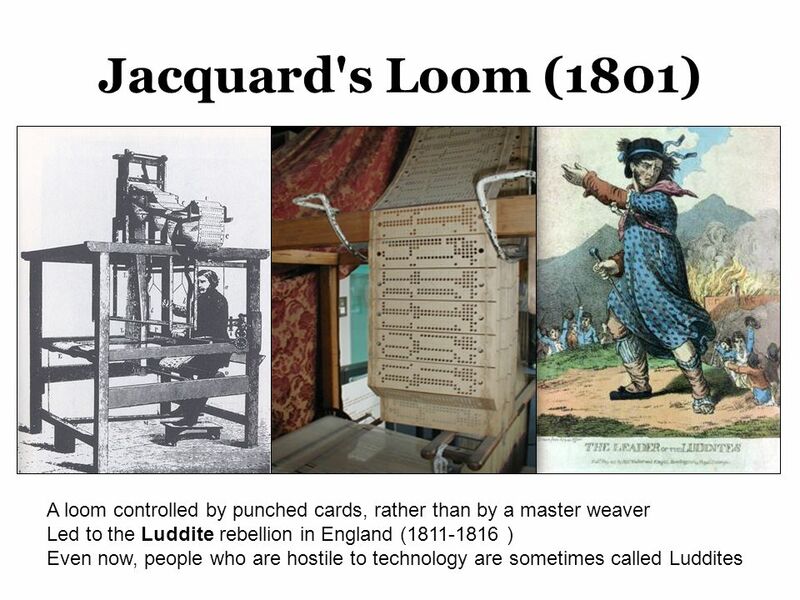 Invented in 1835. 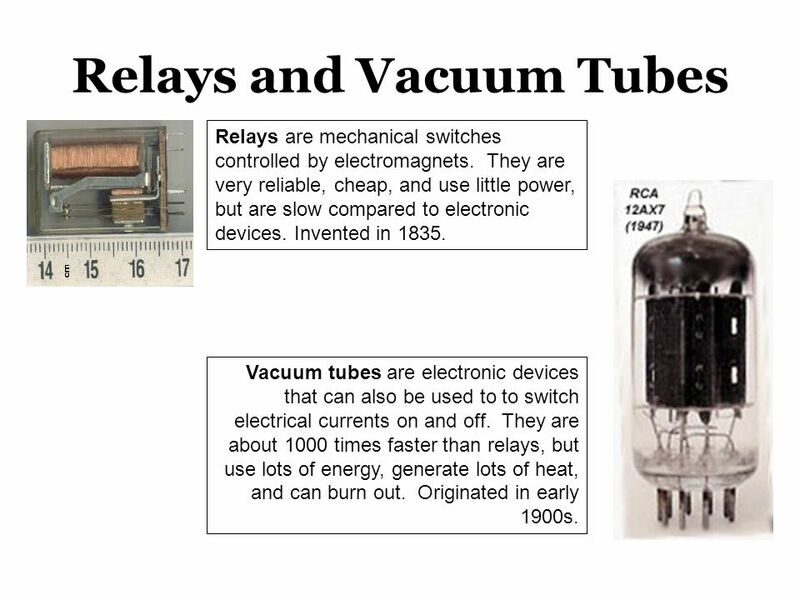 Vacuum tubes are electronic devices that can also be used to to switch electrical currents on and off. They are about 1000 times faster than relays, but use lots of energy, generate lots of heat, and can burn out. Originated in early 1900s. 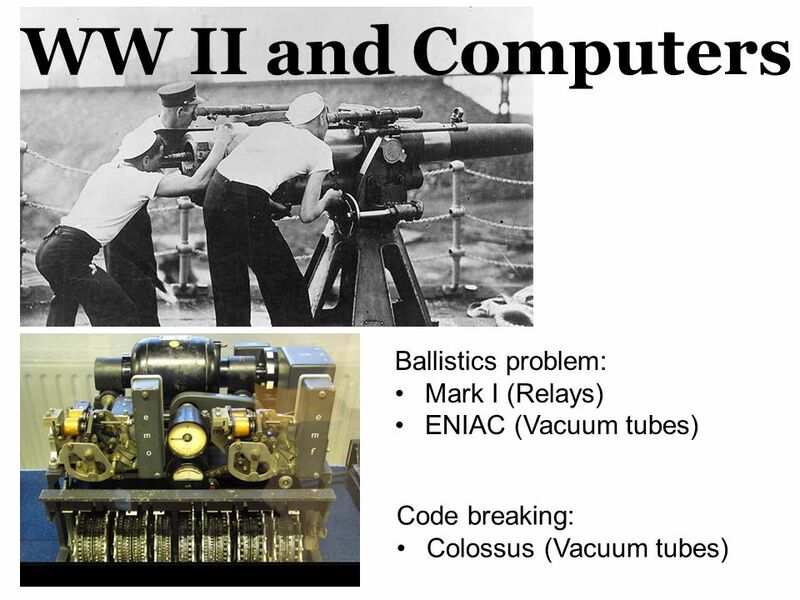 military firing-table calculation, atomic-weapons design During the 11 years ENIAC was online, it did more arithmetic than the entire human race had done up to (Wired) Commisioned in 1943, unveiled in 1946 1000 times faster than electromechanical machines "Programmed" by rewiring it Contained about 17,500 vacuum tubes, 1,500 relays, and 5 million hand-soldered joints. 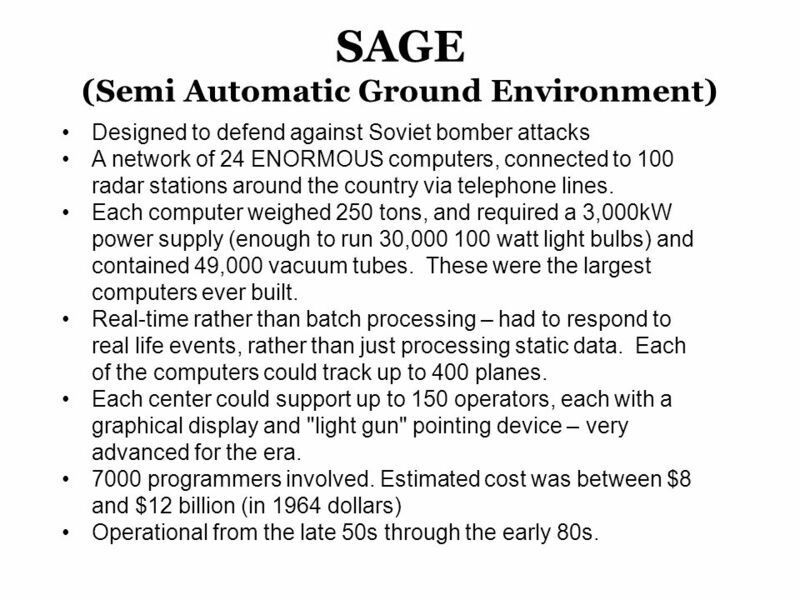 Operator consoles A SAGE building Part of one of the computers Magnetic core memory each operator console was equipped with an integral cigarette lighter and ashtray. 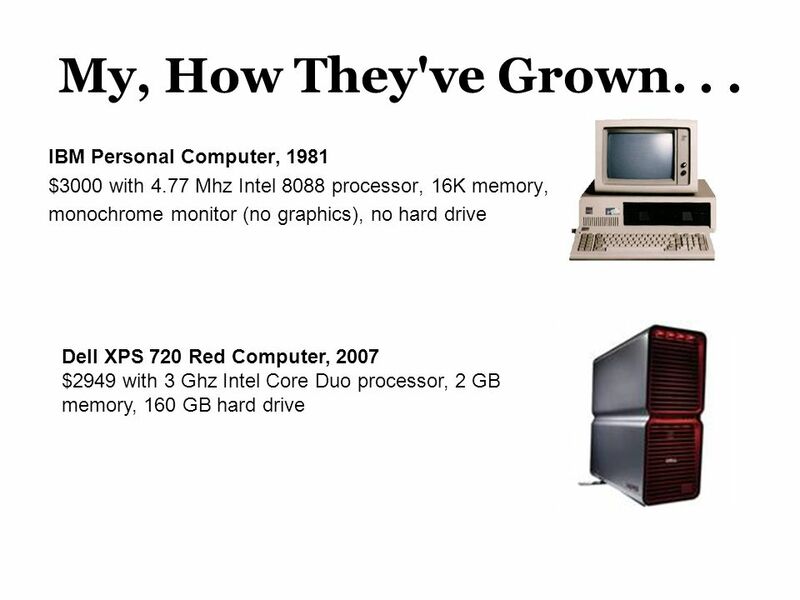 19 The 60s During the 1960s, computers became faster, smaller, and cheaper. 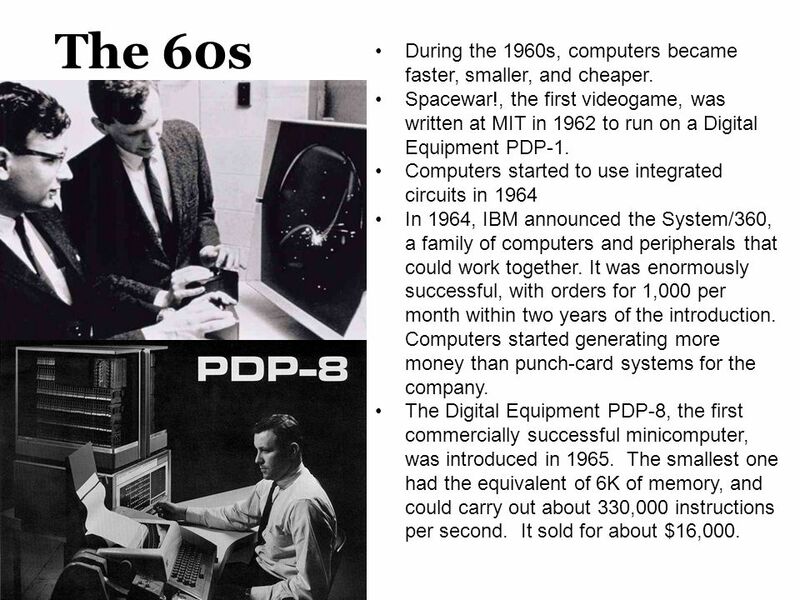 Spacewar!, the first videogame, was written at MIT in 1962 to run on a Digital Equipment PDP-1. 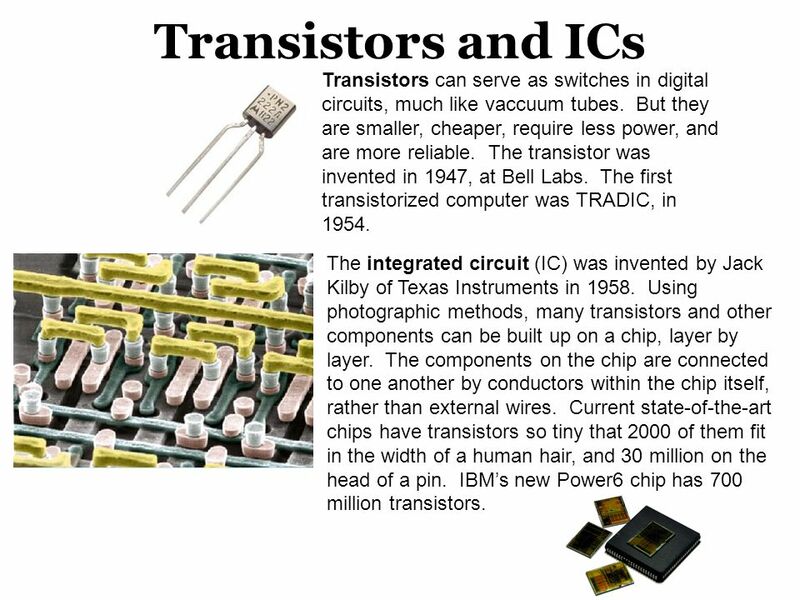 Computers started to use integrated circuits in 1964 In 1964, IBM announced the System/360, a family of computers and peripherals that could work together. 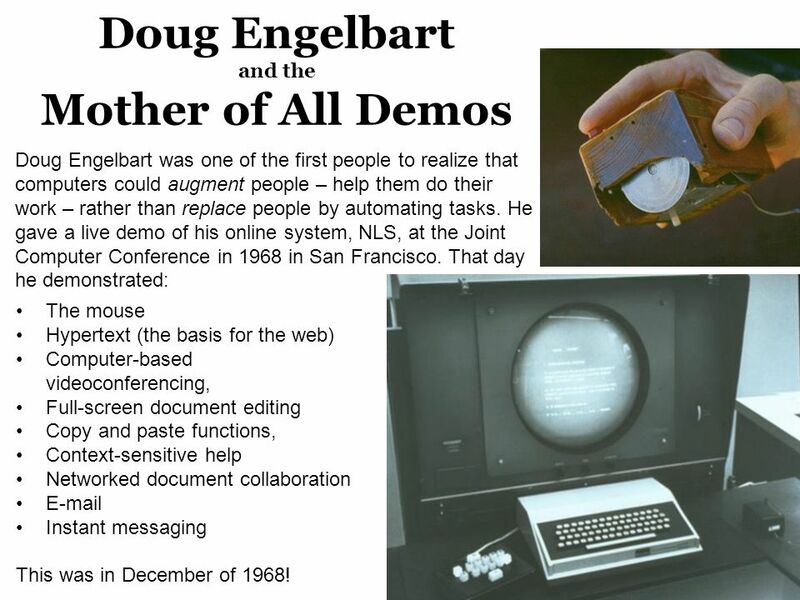 It was enormously successful, with orders for 1,000 per month within two years of the introduction. 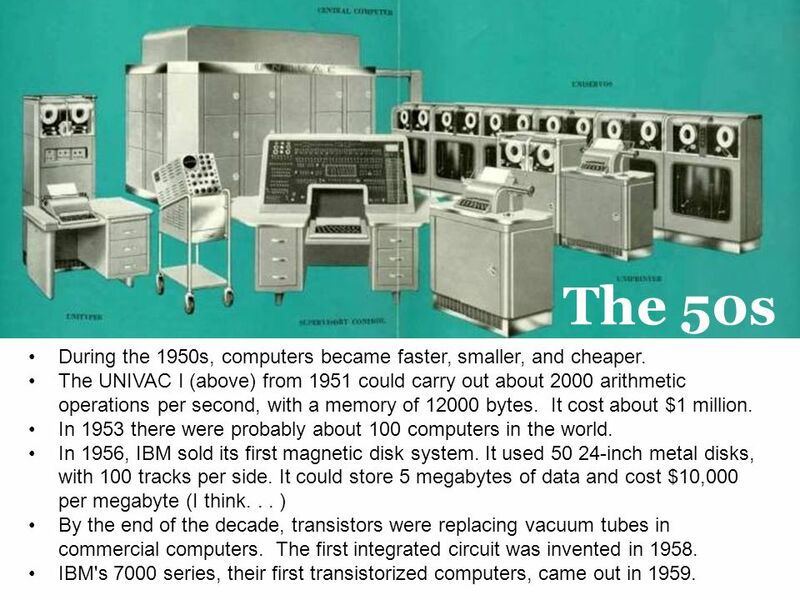 Computers started generating more money than punch-card systems for the company. The Digital Equipment PDP-8, the first commercially successful minicomputer, was introduced in The smallest one had the equivalent of 6K of memory, and could carry out about 330,000 instructions per second. It sold for about $16,000. 20 Mainframe Computers. 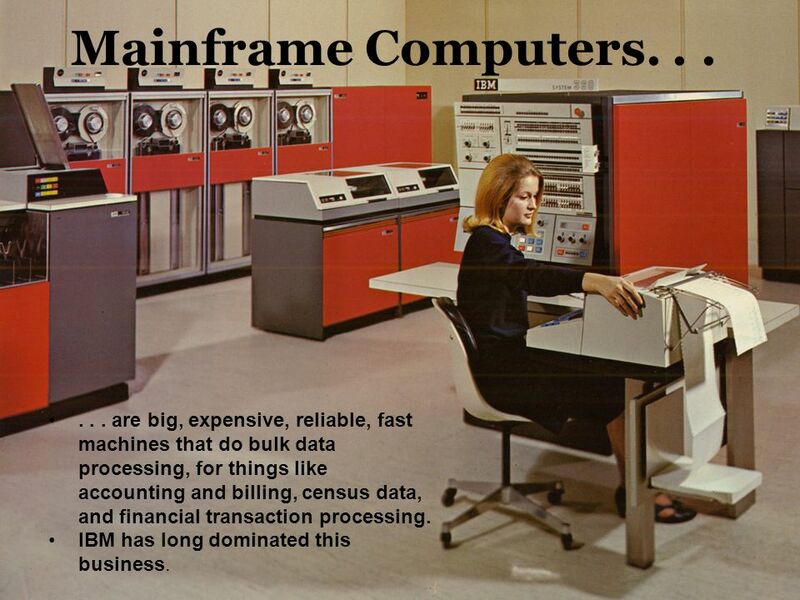 . . Generally room-sized, with air conditioning, raised floors, etc In the 1960s mainframe manufacturers were known as IBM and the 7 dwarfs (Burroughs, Control Data, General Electric, Honeywell, NCR, RCA, and UNIVAC) Mainframes give lots of control – data is centralized Mainframes were thought to be dying out in the early 90s but have turned out to be very useful . . . are big, expensive, reliable, fast machines that do bulk data processing, for things like accounting and billing, census data, and financial transaction processing. IBM has long dominated this business. The Altair 8800 is commonly regarded as the beginning of the personal computer era, in It was sold as a kit for $595, with an 8080 processor running at 2 Mhz, and 256 bytes of memory. As sold, It had no keyboard – programs and data were input through switches on the front, and output was via blinking lights. Additional memory and devices could be added. 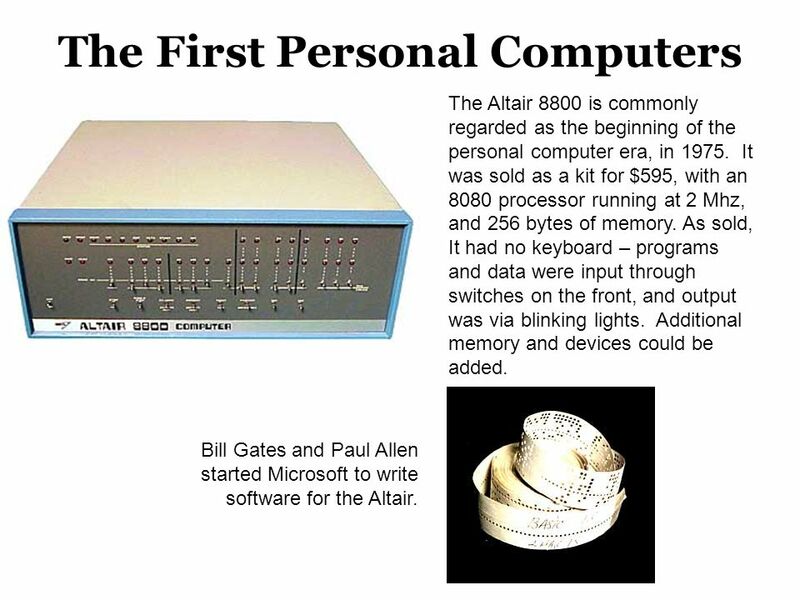 Bill Gates and Paul Allen started Microsoft to write software for the Altair. 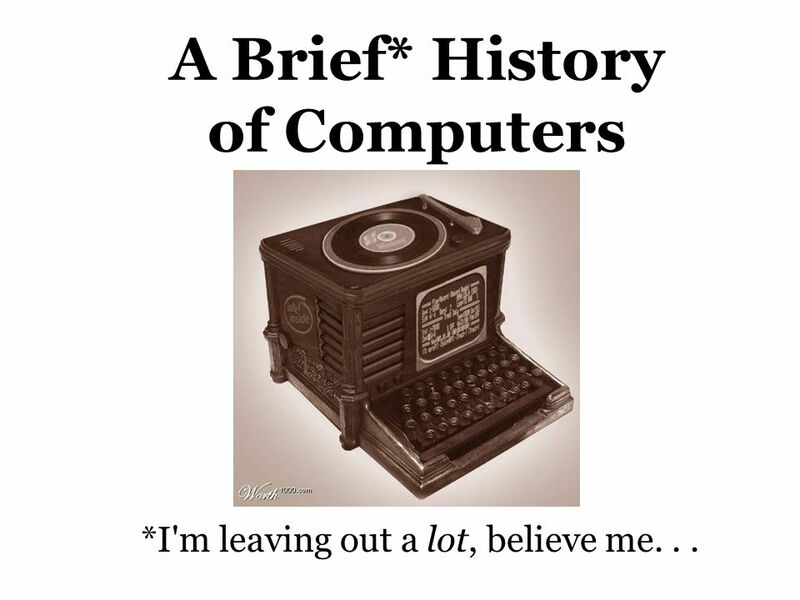 Download ppt "A Brief* History of Computers"
Computer Skills Preparatory Year Presented by: L. Obead Alhadreti. 11 Copyright © 2011 Pearson Education, Inc. Publishing as Prentice Hall. 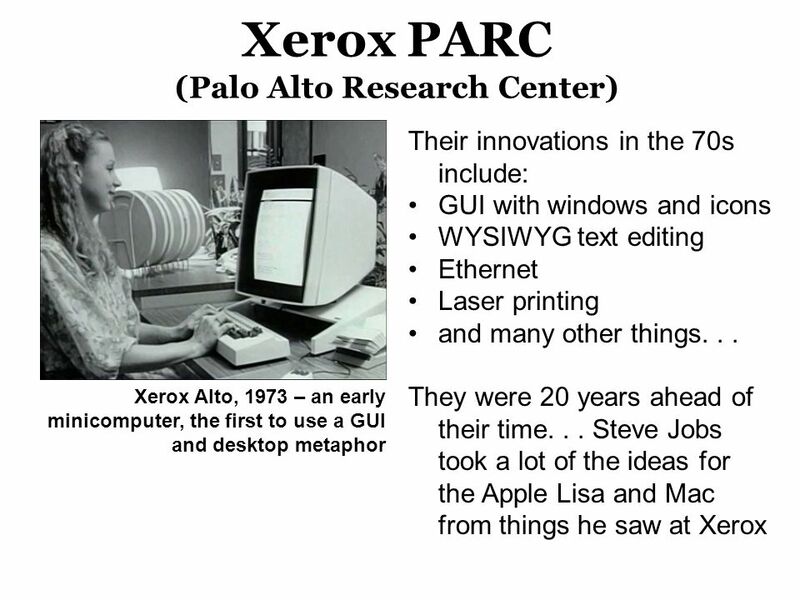 The History of IT 1.01 Understand information technologies and knowledge pathways. 11 Copyright © 2010 Pearson Education, Inc. Publishing as Prentice Hall. 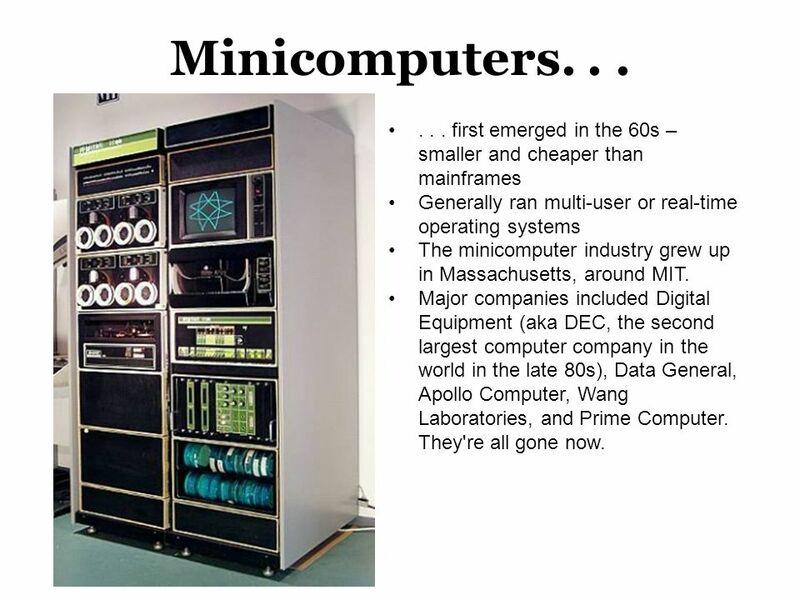 History of the Micro-Computer. Group Question Get into a pair of two. You have three minutes to come up with two answers and make an educated guess at. 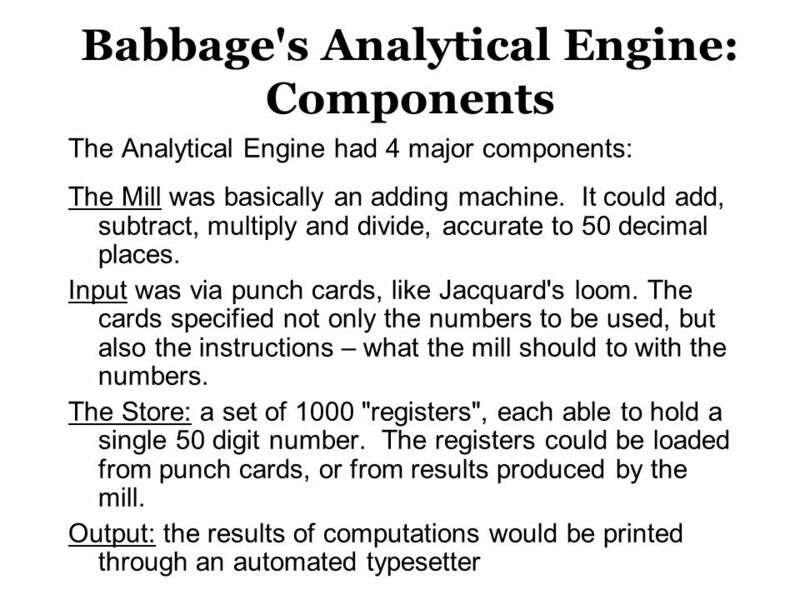 1 Core Ingredients of Computing A “universal” machine Programmability Binary Code (everything stored as “0” or “1”) Program and Data are interchangeable. Chapter 2 Data Manipulation. Before we start About the Lab Project. –BASIC Programming: Requirement file on the web site. Due date is posted. Save your. Chapter Chapter Goals Describe the layers of a computer system Describe the concept of abstraction and its relationship to computing Describe. Chapter 1 The Big Picture Chapter Goals Describe the layers of a computer system Describe the concept of abstraction and its relationship to computing. 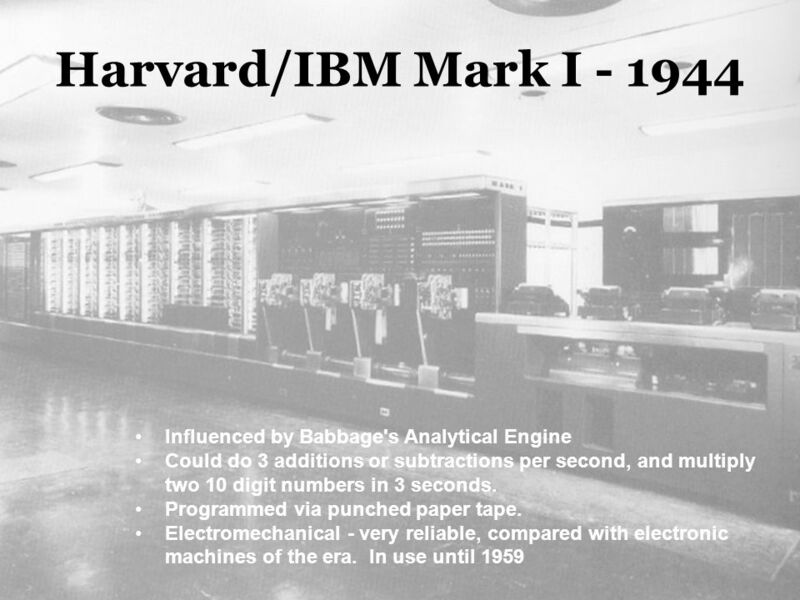 Computer History Presented by Frank H. Osborne, Ph. D. © 2005 Bio 2900 Computer Applications in Biology. Appendix The Continuing Story of the Computer Age. 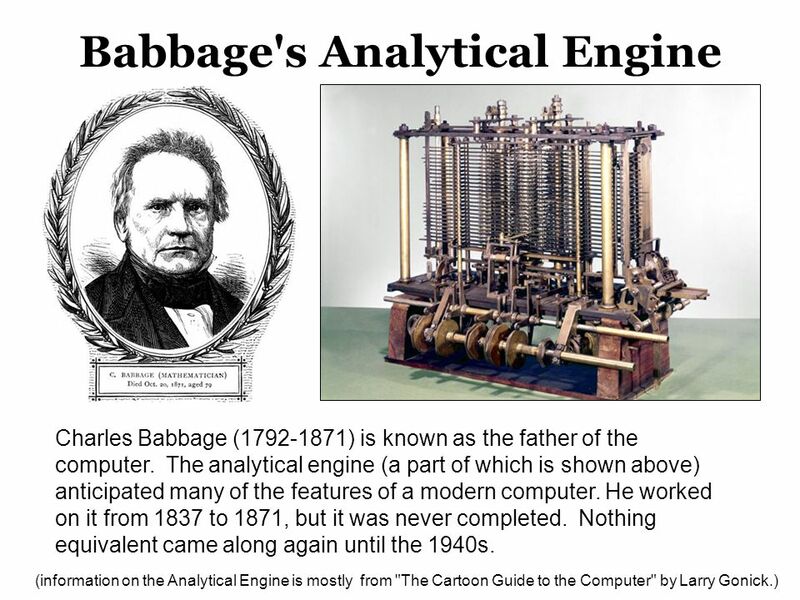 History of Computers Lecture 1. 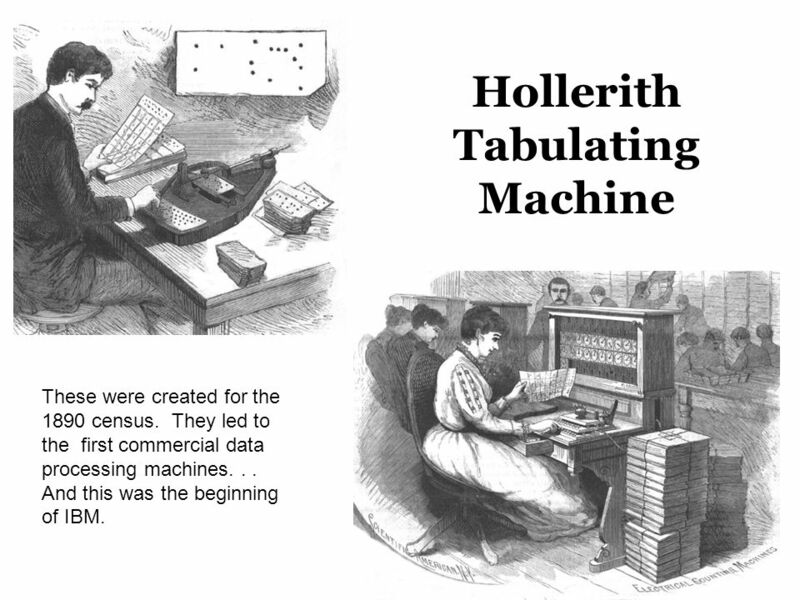 History of Computers Mechanical Computers –Abacus –Jacquard Loom –Player Piano –Difference Engine –Analytical Engine –Hollerith. IE Manufacturing Integration. Module Requirements Assessment: – Word Test15% – Excel Test15% – PowerPoint Test15% – Final Test35% – Report20% Class. 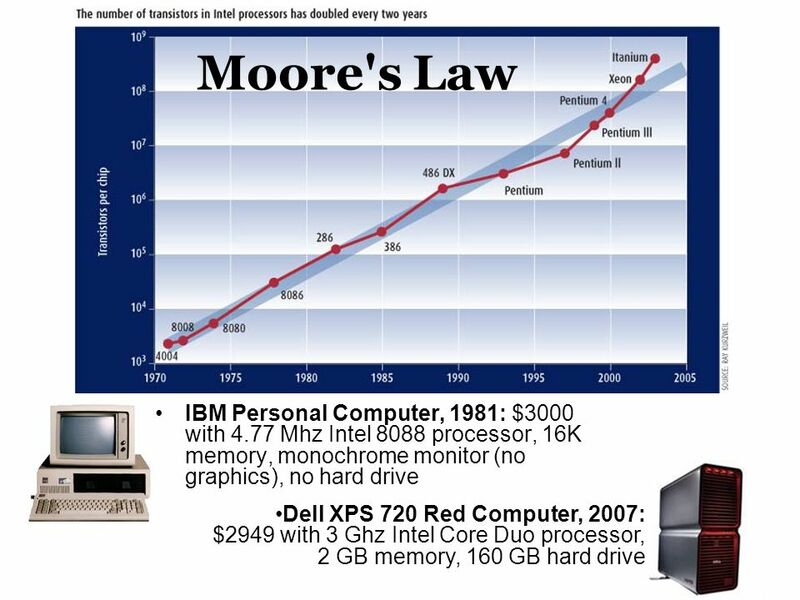 Facts Cited in DVD “Computers” Computing Speed Current personal computers can do 100 million calculations per second. The most powerful computer, like. 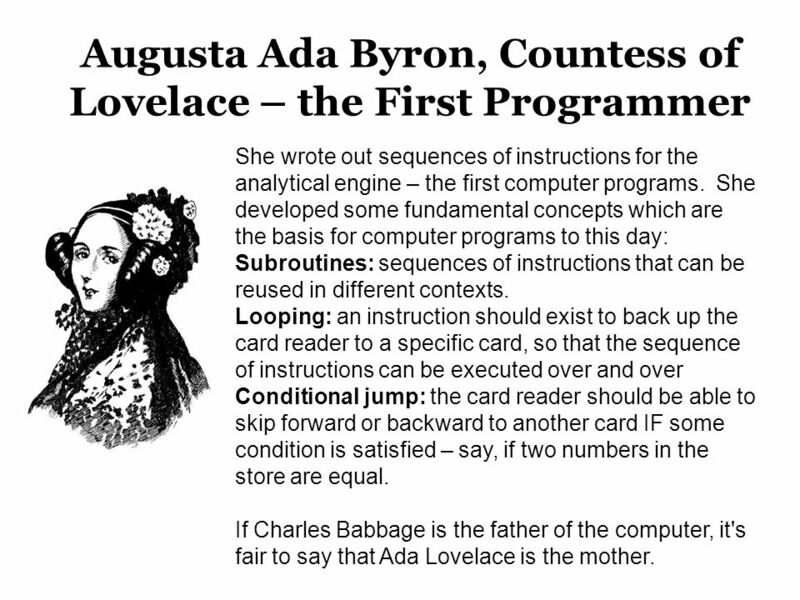 1 CSE1301 Computer Programming: Lecture 34 Introduction to the History of Computing. 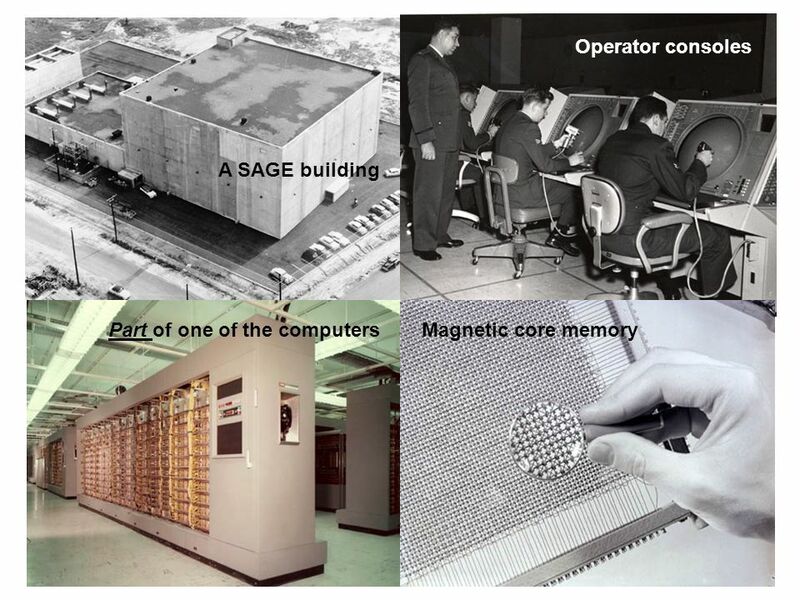 1 The development of modern computer systems Early electronic computers Mainframes Time sharing Microcomputers Networked computing.